Begonia Santa Cruz Sunset is a spectacular long blooming container plant, Spring through frost. This begonia is very heat tolerant for a Begonia, blooming for a long season. 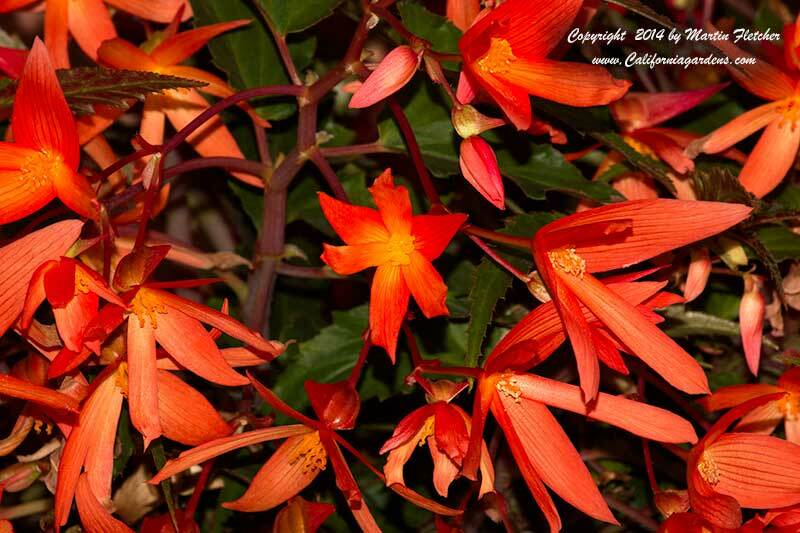 In milder climates and indoors Begonia Santa Cruz Sunset is a perennial. Where there is Winter frost Begonia Santa Cruz Sunset is treated as an annual. Seeds need moisture to get them going but once established Begonia Santa Cruz Sunset is fairly drought tolerant. Begonia boliviense Santa Cruz Sunset performs best with well drained soils in relatively dry shady gardens or hanging baskets. Flowers and foliage of Begonia Santa Cruz Sunset. High resolution photos are part of our garden image collection.